When tragedy strikes, you want to make sure your assets are divided according to your will. With estate planning and will preparation services from Geary & Associates, P.C., in Kingston, Massachusetts, you can ensure all your affairs are in order before an emergency. By preparing a will, a healthcare proxy, and a durable power of attorney, you can appoint someone you trust to make the big decisions when you're unable to. During a comprehensive meeting, we determine how your affairs and possessions will be handled once you're gone. 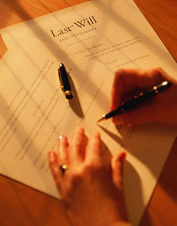 We prepare everything for you before the papers are notarized and finalized. Probate court primarily involves probating estates when a loved one passes away. We take the necessary steps to ensure all assets are accounted for before dividing them amongst family and friends according to your loved one's will. Request services from our friendly family law team in Kingston, Massachusetts, by contacting us today.